Starting in April of 2015, Pikipedia editors agreed on making April Fool's Day jokes on the wiki. These pranks are made in good faith, and only exist to entertain the readers. Although pretty much nothing is to be taken seriously, none of the pranks are to go overboard, to the point of being offensive or destructive. Readers who came to the wiki to learn about a subject should still be able to, after all. Normally, these are created by staff members, are placed on the wiki at midnight (GMT) of the first of April, and are reverted back after 24 hours. After being reverted, the April Fool's Page gets updated with information about the year's prank, in order to enlighten readers on what the joke was. For a list of steps to take before, during, and after the events, please read the talk page. Editors can add to the joke articles at any time after April Fool's Day has passed, but they must have a good reason to do so. The idea of the joke and its core contents should be kept intact. For instance, adding an image to a gallery of funny images is all right. Changing the plot of a game is not. In addition, each article can also have extra contribution notes on its April Fool's Day disclaimer box. The following is a list of jokes made so far. The Bolbert article is Pikipedia's first April Fool's Day joke. It details information about a made-up enemy called a "Bolbert", that is actually a description of Bulborbs and mimics, said to be quite elegant, when in reality, the images show Bulborbs in hilarious poses. The idea for this joke article came from a post on Miiverse that, when shared, caused a lot of laughs within the editor community, half due to the incorrect name given to the Red Bulborb, half because of the enemy's face in the screenshot. The article would focus on a fake Bulborb-like creature said to be quite majestic, only to have the images on the page show hilarious Bulborb poses. The name of the invented enemy and the main image come directly from the Miiverse post. In this joke, Pikipedia does not attempt to mock the player in the Miiverse post. We understand that not all players are familiar with the names of the enemies, and as such, would not dare to acknowledge such player mistakes, much less ridicule them. The image and name combination however, were just too funny for the community to ignore, leading to the creation of this light-hearted parody enemy article. Paper Mario: Color Splash got announced in a Nintendo Direct not long before the time of this April Fool's Day. The trailer revealed that Nintendo plans to keep several of the features that made Sticker Star so controversial, which in turn caused a fair amount of controversy for Color Splash. Seeing this opportunity, some members of the Pikmin fanbase got together to discuss the idea of a mock Pikmin game announcement, based on what is known about Color Splash, with special care to all the controversial parts. The idea was to originally create an article of a game mocking Fire Emblem Fates, for the same reasons, but Color Splash was chosen for being more recent and closer to Pikmin. 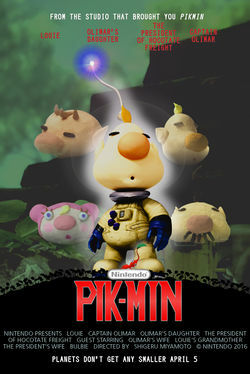 The plot and gameplay mechanics for this made-up Pikmin game try to stay parallel to the most defining parts of Color Splash, but at the same time, exaggerate some of them for the sake of humor. Some time before April Fool's, some NIWA members gathered around to discuss the possibility of a collaborative April Fool's joke. The premise would be that Nintendo announced a new franchise, the Nintendo Cinematic Universe, as a parody to the Marvel Cinematic Universe. Like the latter consists of a collection of Marvel franchise films, the joke would involve a series of movies about different Nintendo franchises. Being a collaborative joke, other wikis would make fake articles about the Nintendo Cinematic Universe and whatever movie they wished, all keeping the same theme. Only SmashWiki and Mario Wiki joined in, besides Pikipedia. The Pikmin movie in this line-up was decided to be a parallel to Ant-Man. Given that in both the Ant-Man and the Pikmin franchises, the human(oid) heroes are of a small size compared to their surroundings, and are able to control an army of colony insects, the connection was clear as day straight from the start. The similarity between the two series' names also made the final movie's name an easy choice: Pik-Min. Pikipedia's front page on April Fool's Day 2017. Like the previous year, some NIWA members got together for a collaborative joke. This time, the wikis would pretend that their subjects are instead about a Sony franchise. It wasn't hard to decide that Pikipedia should represent the Patapon series – both Pikmin and Patapon have the player control a horde of minimalist creatures, and the names are pretty similar to boot. The gameplay of Patapon is radically different however, in that all units are controlled at once, and their orders are given by carefully timed drum patterns. The joke involved editing the main page with Patapon facts, completely as if this wiki – then named Patapedia – were a legitimate wiki for the franchise. To really drive the point home, the main page's theme was also changed to an orange, black, and white theme, reminiscent of Patapon. The wiki's logo and main page imagery were also updated accordingly. For the sake of simplifying the process and cleanup, the wiki's favicon, title, and sidebar were not changed. Although everything that is on the front page is (presumably) fact, and appropriate for a Patapon wiki, the links aren't whatsoever. The April Fool's project comes mostly in the form of this change, but there is some humor in the links: they indirectly compare things like Ciokina and the Peckish Aristocrab, or the PS Vita with the Nintendo 3DS. They're far from gut-busting jokes, but hopefully good enough that they'll bring a hearty smile to fans of both franchises. SmashWiki created an article on PlayStation All-Star Battle Royale, and made it the featured article. Every wiki did things their own way: some changed the front page and theme, some only changed either one, others didn't even change a thing, but only created articles. Captain Olimar and Louie walking into Hocotate Freight. There are a lot of jokes about the Philips CD-i games starring Nintendo characters, mostly because of their debatable quality and really bizarre cutscene styles. With the brief resurgence of Hotel Mario as a meme, particularly the part of the opening cutscene where Mario and Luigi are walking into the Mushroom Kingdom, the editorial staff got together to discuss the possibility of remaking the cutscene, but with Pikmin characters and themes. The idea was to keep the same weird "MS Paint-like" style and goofy nature of the original, but with as much content remade as possible to match the Pikmin universe. In this new cutscene, Captain Olimar replaces Mario, Louie replaces Luigi, Bowser is replaced by the Emperor Bulblax, which could be considered Olimar's top antagonist in his first adventure, and the plot starts with both explorers talking about how the President invited them for a vacation, much like how Mario and Luigi are invited to a picnic by Princess Peach. Eventually, they notice a letter by the President, which was actually written by Bowser in the original. The letter explains how their vacation was replaced by a mission to repay the debt, very similarly to Pikmin 2's main plot point. The letter draws some more parallels with the Hotel Mario scene, like the captive ship in the All-Devouring Black Hole Loan Sharks and the captive princess in the Koopa Hotels. After this, the part where Mario explains that the player can read the manual to get help with navigating the hotels is replaced with Olimar explaining how the player can read the enclosed data file for help on how to control the Pikmin. In the end, the entire cutscene was rebuilt, low audio quality and everything, and the only thing that has not been changed is the letter song. The core of the joke is just the video itself, but it also made sense to create a fake article about how this cutscene for a new Pikmin game got leaked. Super Smash Bros. Ultimate had been recently released, and it brought back several "Smash Taunts" from previous entries in the series. These include Snake's codec calls, Palutena's Guidance conversations, and more. These events happen during gameplay with specific characters and stages, and when a specific player presses the down taunt button very quickly. If they pull it off uninterrupted, the conversations will start, and will be overlaid on-screen on top of the action, serving mostly for distraction and amusement. Their secondary goal is to provide info on a given fighter, but more often than not, they're not very serious and mostly make jokes at the expense of the Nintendo characters. Given that, in his games, Captain Olimar usually writes down his own interpretations of enemies and "treasures", and how these logs are mostly humorous, since he misinterprets a lot of things we take for granted, the idea to create a fake concept for a Smash Taunt about fighter notes sprung up. Super Smash Bros. Ultimate features over 70 fighters, but since each one would only receive a paragraph or two of text, the editors behind the joke went for it. The concept behind these entries were that some would be informative of the character's nature, some would expand on Olimar's life, and some would be funny misinterpretations of the characters's actions and looks, similar to how the captain's journal entries in the canon games work. On the side, a completely unrelated joke had been made, exclusively as a video. This joke involved a never-before-seen trailer for a cancelled accessory for the Nintendo GameCube. It was basically an NFC reader like the Nintendo 3DS has, which allows the device to read amiibo. The trailer shows Super Mario Sunshine reacting to several Yoshi amiibo, by giving the player a Yoshi of that color with unlimited juice. Then, some clips of Luigi's Mansion, and how that game gives Luigi some altered clothes based on the Mario character amiibo that are scanned. Finally, the trailer shows Pikmin 2 reacting to the Super Smash Bros. Olimar amiibo by unlocking a two-player co-op mode in story mode. The content presented in the video was achieved with video editing and hacks. Naturally, nothing like that could ever be real, since amiibo were created long after those games had been released. This page was last edited on April 2, 2019, at 18:22.